As part of the ongoing Temple Street streetscape improvements and of the push to green our city, I was joined by members of the Hollywood/Los Angeles Beautification Team, the city's Environmental Affairs Department, and leaders from the Filipino American Community of Los Angeles (FACLA) to plant the final two of 75 purple orchid trees that have been placed along Temple between Glendale and Hoover. Planting these last two trees represented the last step in completing the Temple streetscape masterplan, a community-driven strategy to beautify the area that began over two years ago. Temple runs through the heart of Historic Filipinotown, and the revitalization of the boulevard has symbolized the resurgence of the entire community, led by the commitment of the Filipino community. 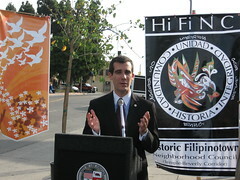 From the printed sidewalks that cross Temple at Glendale, Hoover, and Alvarado to the nation's first Filipino WWII Veterans Memorial at Lake Street Park, the physical improvements are a manifestation of the community’s pride and investment in their neighborhood. And as the purple orchid trees blossom into full grown fixtures of the Temple streetscape improvement, Historic Filipinotown will continue to blossom as a center for cultural celebration and economic revitalization.